With a passion for life science, conservation and education, my academic and professional experience has taken me on a convoluted path. That unique path has led me to my current role as the Education & Outreach Specialist for the Arabidopsis Biological Resource Center (ABRC) and the Center for Applied Plant Sciences (CAPS), both under the direction of Dr. Erich Grotewold at The Ohio State University. My experience highlights one of many alternative career paths for individuals interested in science who may not want to conduct research. I see myself as an informal science educator, a career choice that was not obvious to me when I began my education years ago. Graduating with a B.S. in Wildlife Biology, I had little clarity as to what type of career I wanted to pursue. With a love of animals and conservation, I looked to the Columbus Zoo and Aquarium as an obvious choice. It was there that I began my career as an educator. 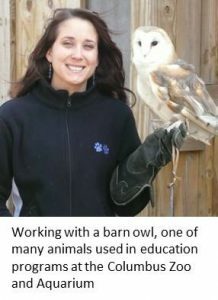 Working with a variety of programs for visitors ranging from pre-school through adulthood, I was able to blend my desire to work with animals with my interest in teaching. At the Zoo, I focused on teaching about Ohio native habitats and wildlife, and encouraging people to make positive changes for a more sustainable world. During this time I became involved in a program called Earth Expeditions (http://earthexpeditions.org/). This eventually led to my enrollment in the Global Field Program (GFP) at Miami University (http://gfp.projectdragonfly.org/), where I earned my M.A. in Zoology. 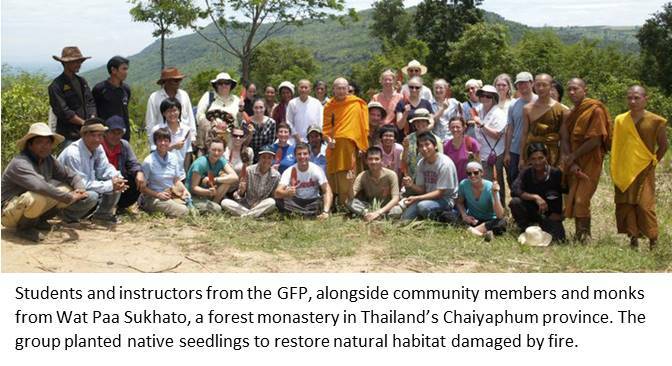 The Global Field Program is a unique graduate program focused on inquiry-driven education, environmental stewardship, and global understanding. Through the program’s amazing summer field courses, I traveled to Trinidad, Kenya, Belize and Thailand. These field courses immersed me in learning about topics such as environmental education, community-based conservation, tropical, forest and marine ecology, Western and Eastern modes of understanding nature, and more. While I credit my time at the Zoo as setting the course for my future career, the amazing experiences I had with the Global Field Program further developed my education skills and re-inspired my desire to work with the community. Between the Zoo and OSU, I worked for a local school district running the before- and after-school programs, and at the Center of Science and Industry (COSI) as the Director of Energy and Environmental Initiatives. In October of 2015 I made the move to OSU, and joined the ABRC and CAPS teams. In my current position, I coordinate the education and outreach initiatives for our two centers. CAPS (https://caps.osu.edu/) supports interdisciplinary teams of researchers working together to find practical solutions to relevant problems in the areas of photosynthesis and carbon fixation, biomass and bioproducts, crop improvement and functional foods, and plant-microbe interactions. ABRC (https://abrc.osu.edu/) is one of two global stock centers providing seeds, DNA and other resources to scientists and educators worldwide. With more than 1,000,000 stocks of Arabidopsis in the ABRC collection, our center provides samples to approximately 30,000 researchers in more than 50 countries annually. 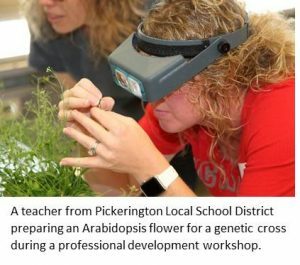 In addition, ABRC has a strong focus on supporting plant science curriculum in K-12 education. ABRC Associate Director Dr. Jelena Brkljacic and staff developed a set of robust educational materials that are available for free on the ABRC education and outreach website (https://abrcoutreach.osu.edu/). These materials, known as Greening the Classroom, include six ready-to-teach modules with detailed protocols, background information, data sheets and instructional videos. Seeds can be ordered free of charge for K-12 teachers. In addition to the Greening the Classroom activities, thirteen additional plant science modules have been donated by the community and are available for download on our website. My goal is to make science fun and accessible for everyone, and to raise awareness about the important role plants play in our daily lives. This includes offering field trips and hands-on activities to local school groups, participating in programs for the general public with our community partners such as COSI and the Franklin Park Conservatory, providing teacher professional development, and promoting Greening the Classroom resources. We are proud to say that ABRC and CAPS education programs reached more than 4,600 individuals in 2016! We are looking forward to an exciting year in 2017, with new program opportunities in the works. 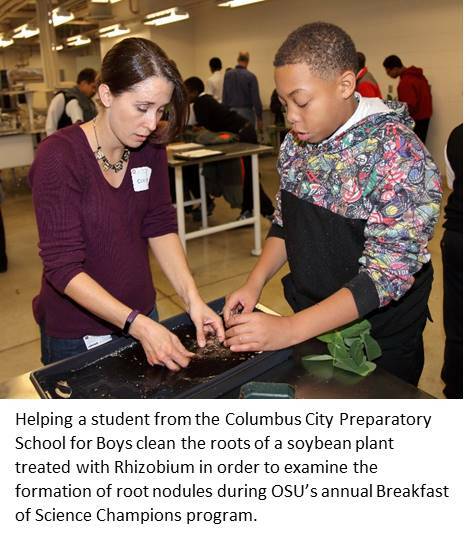 Thanks to funding from the American Society of Plant Biologists’ Plant BLOOME grant, we are working with educators from COSI to co-develop a new program for middle and high school students, as well as a set of educational videos highlighting important concepts in plant science. Want to learn more? Connect with Courtney on Plantae and continue the discussion below! Nice article. I am an Earth Expeditions grad also. Congrats on finding your new career.